First released in the Ski collection. Repromoted in 2013 as part of the Wave Runner Ombre Nail Kit and in 2015 for Summer Favorites and Patriotic Trio. 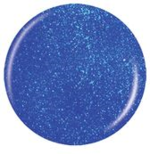 Described by China Glaze as a "Blue high luster pearl." Frostbite was released as a gel polish during the initial launch of Geláze in 2014. Number 606289.